This was a rather nice small museum and gallery, tucked in at the foot of the castle mound. It manages to fit the whole period from when the earth had just started to cool, through to the week before last into two floors, concentrating on the Highlands. 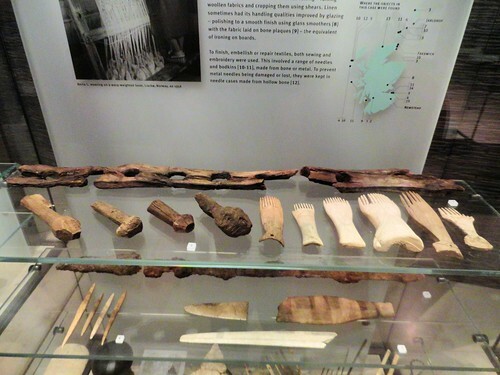 There’s an inevitable Pictish/Celtic slant throughout illustrated with a few quality finds from each location, period and racial grouping of your choice. We spent a wet morning there and managed to identify the snake we’d seen a few days earlier. 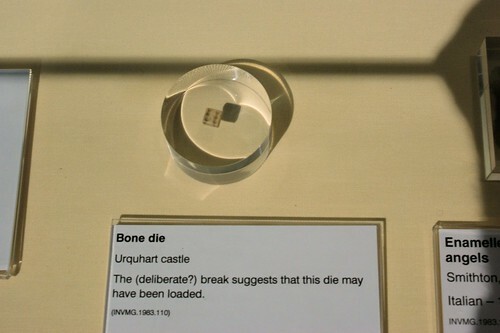 Bone die from Urquhart Castle, possibly loaded. 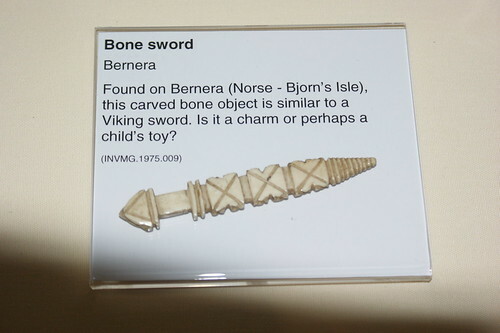 Viking sword charm or toy. This small copper alloy box with a miniature portrait of Bonnie Prince Charlie, painted in oils on a concealed ‘lid’ hidden beneath the outer kid of the box. 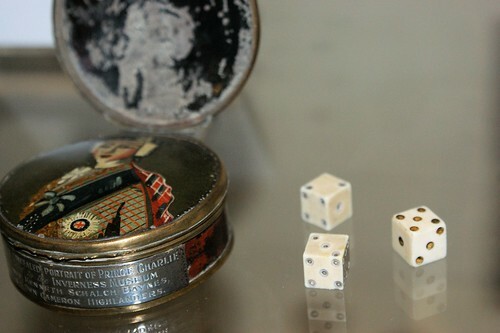 It contains three ivory dice. 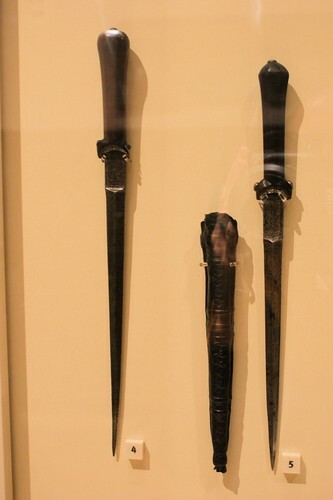 Tage, 18th century, leather on wood with iron nails. This one was submitted to the Editor General on 2 July, 2007 and was printed in the subsequent edition of The International Routier, back in it’s dead-treeware days. Vanity presses me to reproduce it here. 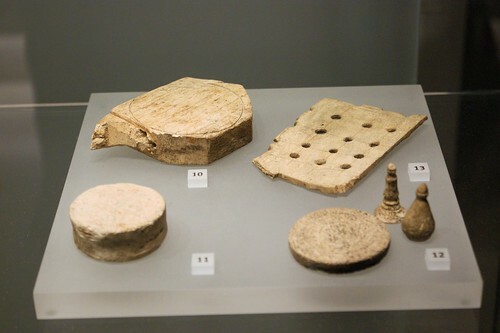 There are no references to dominos in western sources before the middle of the 18th century, when domino games appear to have been played in Italy and France. They are kept in this volume mainly so the Routiers have something to do with their dominoes. And fair enough too, this is the view held by most serious scholars of the introduction of different games into Western Europe. Strutt (1801) says, “Domino… a very childish sport imported from France a few years back”. 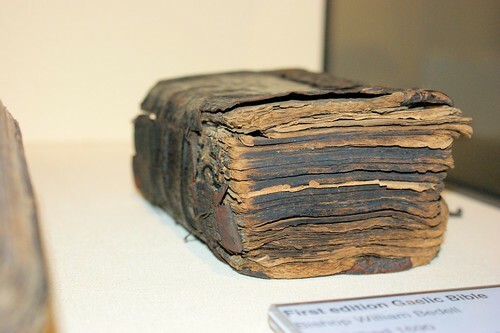 My innocent enough enquiry to the Mary Rose Trust in 1996 about the photo above, simply captioned Domino found on the Mary Rose, resulted in the photo being taken down from the site and a personal apology to me from one of the senior archaeologists. 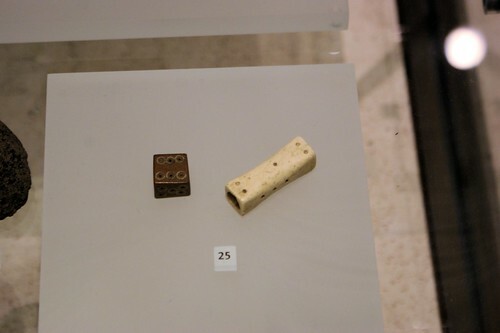 Early 18th century bone domino found in The Solent, allegedly lost from a French prison hulk… or is it? 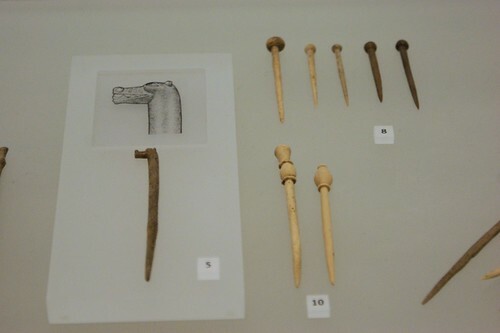 I scored some really nice archaeological drawings of combs, arrow spacers and book covers for my efforts. 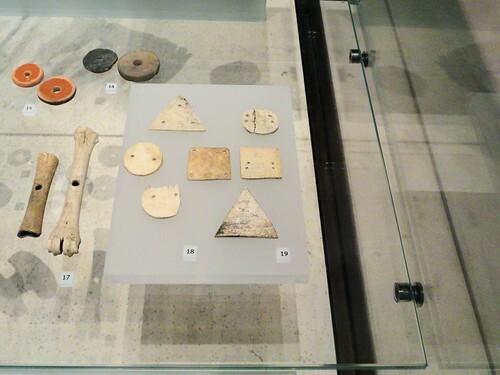 In 2003, I also queried a domino on display in the Southampton Archaeological Museum labelled as 17th century, pointing out their own database showed it as probably 18th century. Here I must admit to being a serial offender. I do have a nice letter from Warwick Castle thanking me for the information I sent them challenging their dating of a leather jack on stylistic grounds. 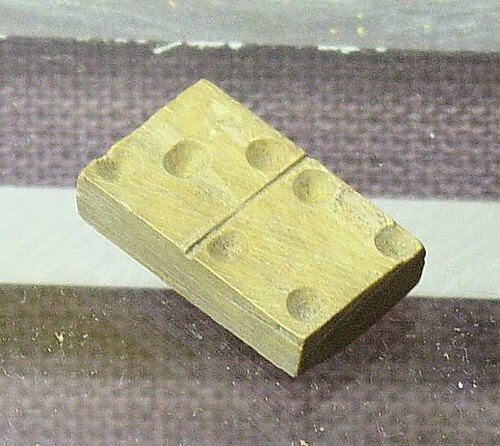 The Southampton domino in question. 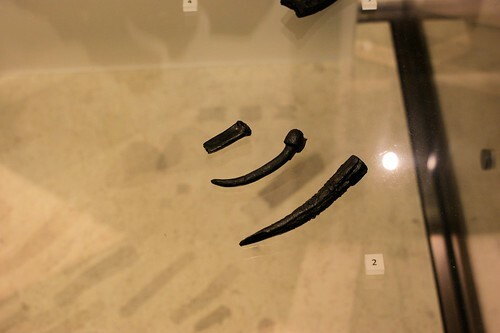 It’s 14mm wide and 23mm long so almost exactly the same size as the Mary Rose find. Photo (and attitude) by me. I’m gratified that at no other point in the book, do Gardiner and Allen go to such lengths to prove something which they say probably isn’t from the ship could have been if it really wanted to be. Henig, M. 1976. “The small finds”. I G. Lambrick & H Woods, Excavations on the second site of the Dominican Priory, Oxford, Oxeniensia 41, 213-22. St Thomas Guild has a nice write-up on making 13th century seven sided dice for use with a number of games the Book of Alfonso X the Wise. There method for making the spots is quite different from mine, but may work better for some of you. I may have to redo that post some time. St. Thomas guild – medieval woodworking, furniture and other crafts: The game of the Four Seasons: making 7-sided dice. Finally. 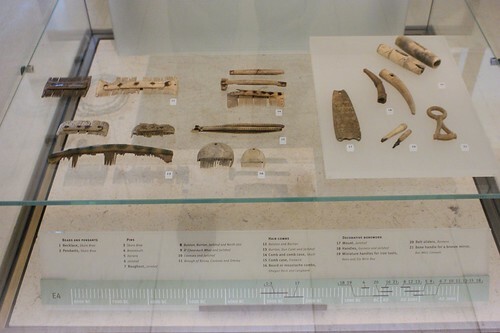 Here’s the long promised skeletal materials gallery from our NMS photos. Leather finds photos are in another post, and I’ve already done the leatherworker’s toolkit elsewhere. Click on the photos in the gallery them to ennoble if you want a closer view. The full set of photos contain lots of stone and metalworking as well. 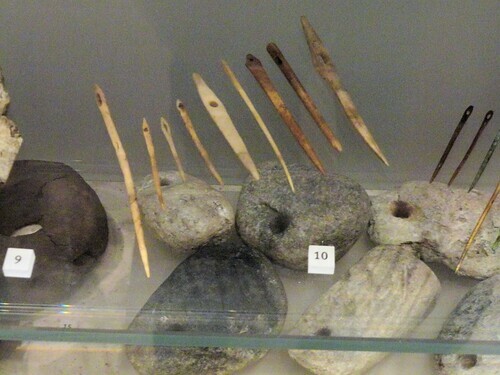 Needles from Hillhead, West Grange of Conon and Laws of Monifieth. 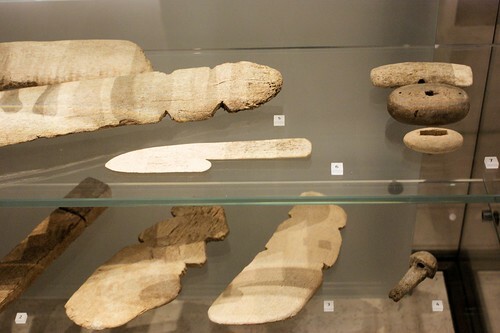 300BC-800AD. 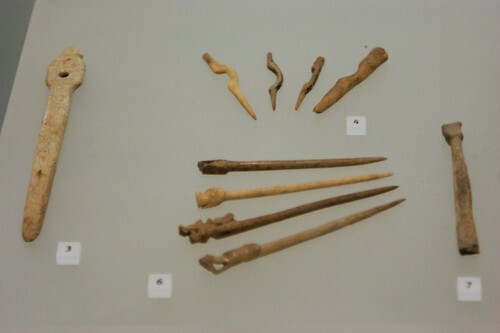 Bone pins, Skara Brae, Broxmouth, Jarlshof, Roughout. 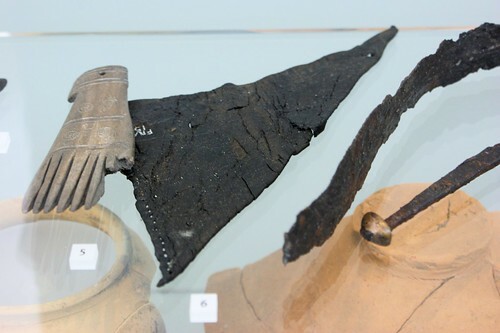 Bronze shears, Loch Erribol, AD1-200. 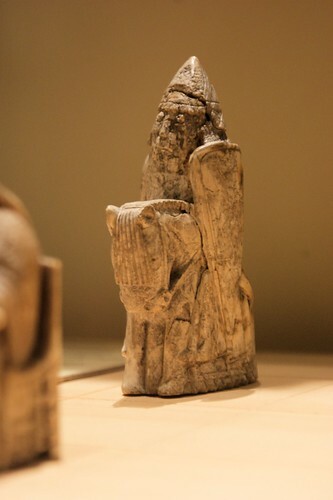 I think this little fellow is walrus ivory, a game piece in the shape of a cowled figure from Mail in the Orkneys, AD750-800. 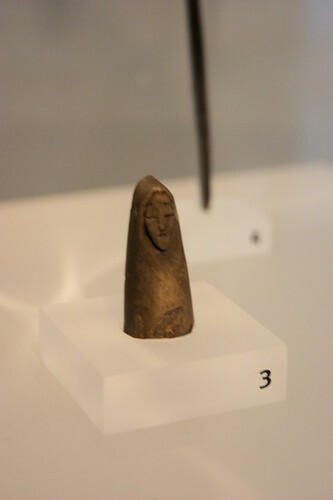 He looks similar to the hooded figures shown on the Pictish standing stones of the period. 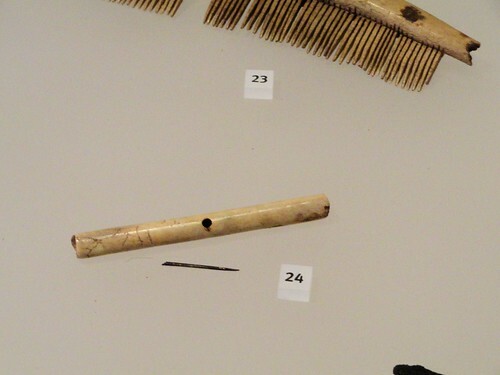 Bone comb from a pagan male Viking grave from a Viking and native cemetery on Orkney. 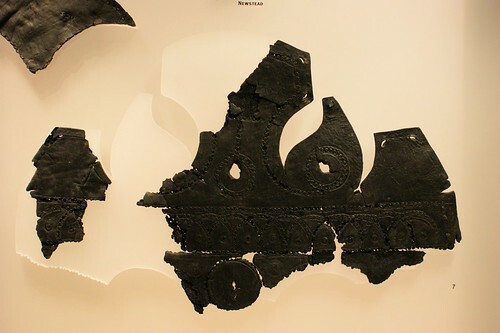 Eighth-ninth century. 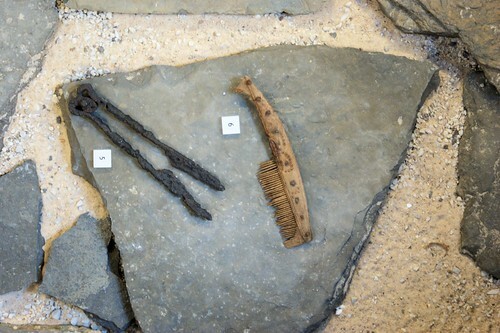 The museum shows the grave as excavated. 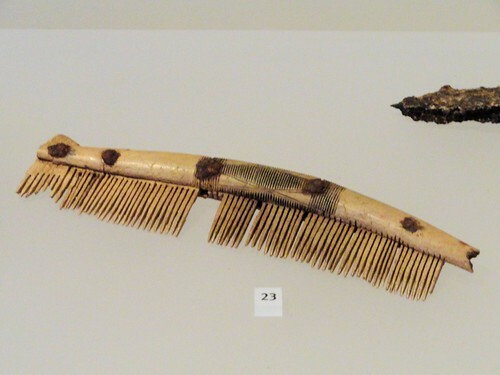 Antler comb from a woman’s grave, Cnip, c. AD1000. 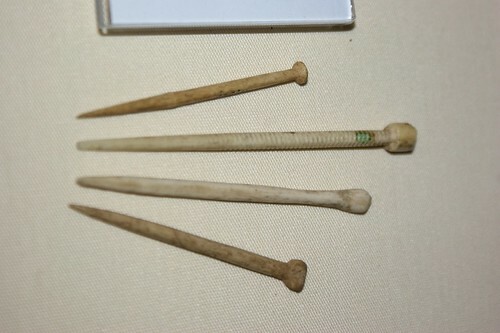 Bone needle case with remains of metal needles. 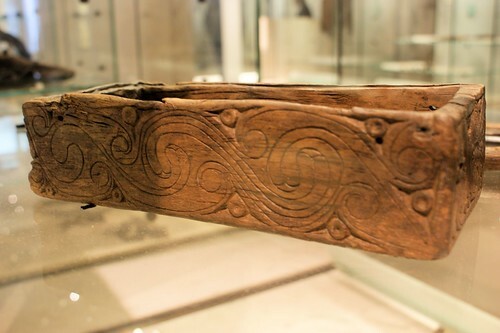 Woman’s grave, Cnip, c. AD1000. Knight from the Isle of Lewis chess set. This one’s a token effort. 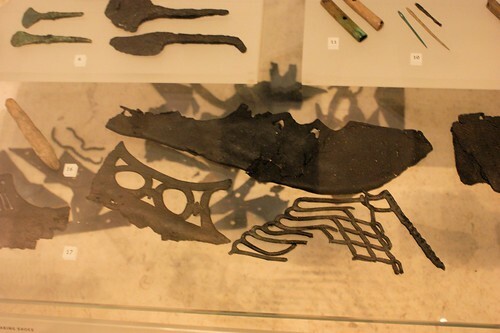 I’ll cover all the pieces in another post as I’ve been chasing them around the various musea that have them. 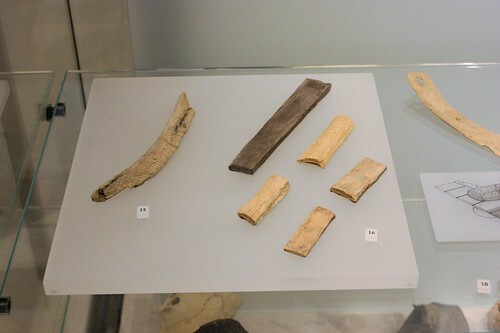 Walrus Ivory, found in Uig, Lewis in 1831. 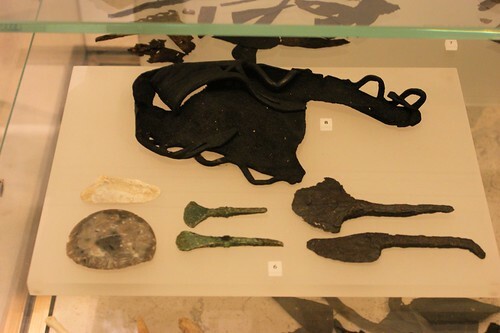 Other pieces are in the British Museum. H.NS19023, H.NS 25-9. 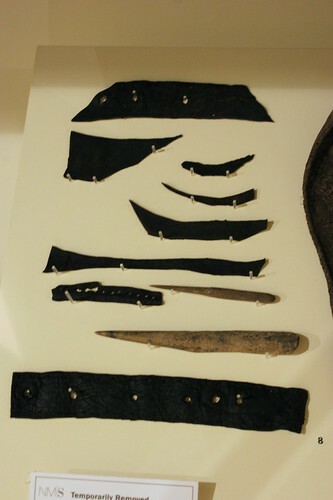 Leather belt pieces and bone awls with off-cuts from leatherworking, from Fast Castle, Berwickshire. 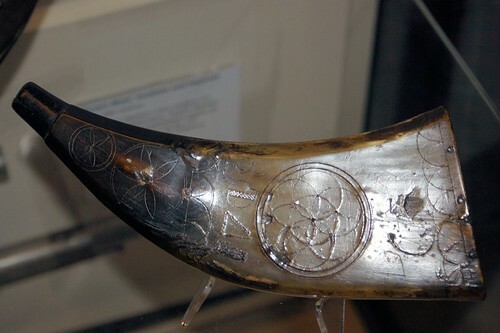 Powder horn belonging to James Graham, 1st Marquess of Montrose (25 October 1612 – 21 May 1650), his arms are engraved in the silver base plate. I’ve finally finished the first cut of the NMS photos. Here for your edification and viewing pleasure is the first lot of leather photos. I’ll do the skeletal materials photos in another post, and I’ve already done the leatherworker’s toolkit elsewhere. Click on them to embiggen if you want a closer view. The full set of photos contain lots of stone and metalworking as well, I’ll also get the textiles and paint photos up in the Fullness of Time™. 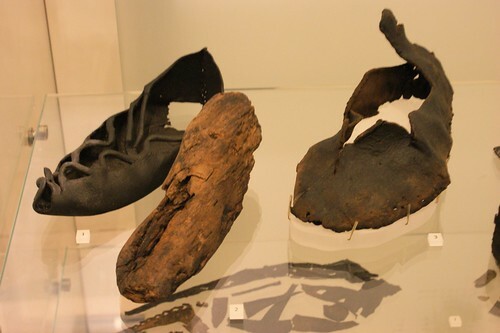 The one-piece shoe on the left is from Newstead (2nd C), the wooden last from Buiston and the two piece shoe from Iona (both 6-8th C). 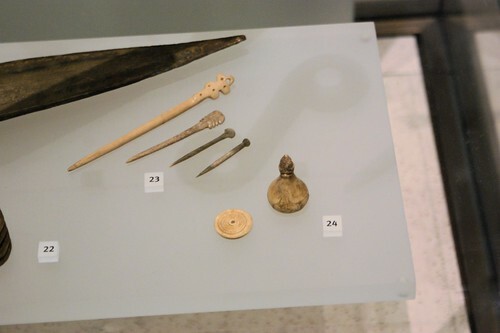 This is one of the problems with the NMS, they group similar items together even though there may be several centuries apart and from different cultures and imply a relationship between the objects that doesn’t necessarily exist. 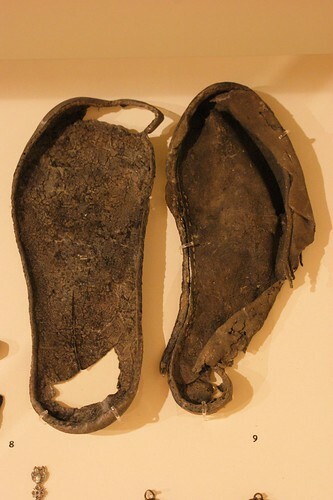 Multi-part shoes, Newstead 2nd Century AD. There’s at least two and possibly three different styles of shoe here. 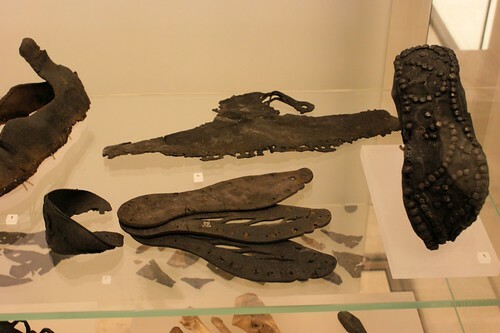 Multi-part shoes, Newstead 2nd Century AD. There’s some unrelated leather working tools on the top shelf. 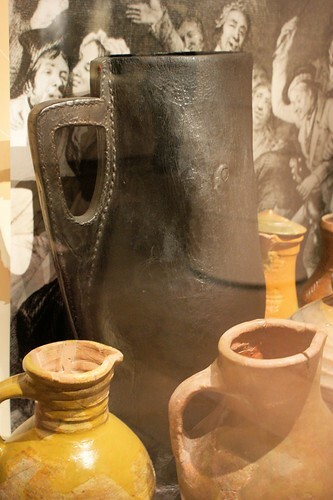 British leatherworking tools. 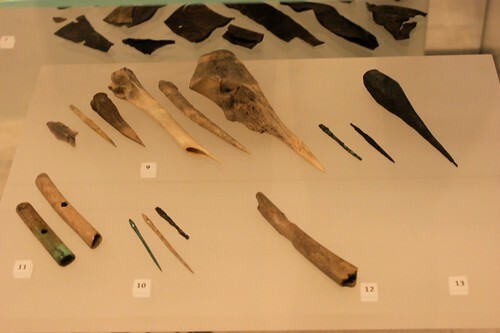 Knives from Cairnholly, Cleughhead, Luce Sands, Traprain Law and Camelon. 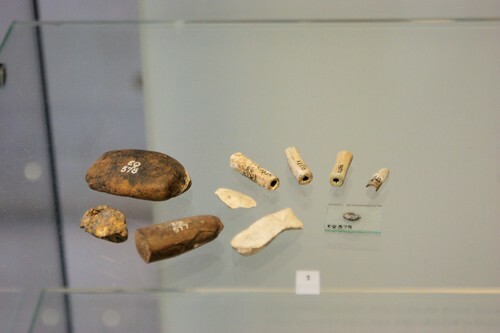 7500BC-900AD. At least the dates are fairly obvious on this set, even if it does cover nearly 8000 years. The shoe is from Newstead. 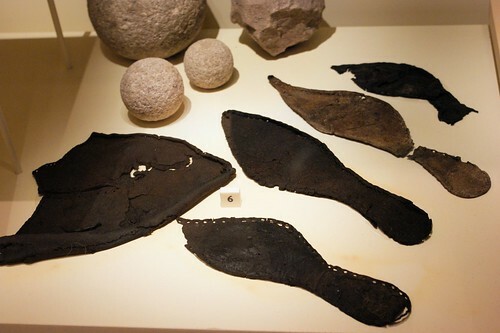 Leather shoes from the lead mining site at Sillerholes, West Linton, Peeblesshire. 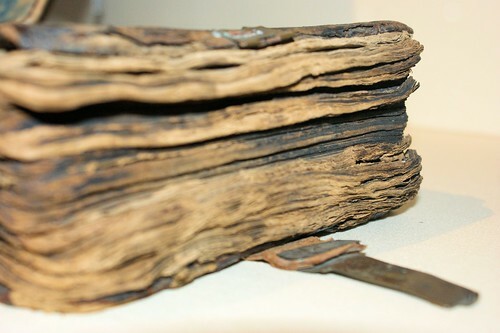 13th to 14th century. 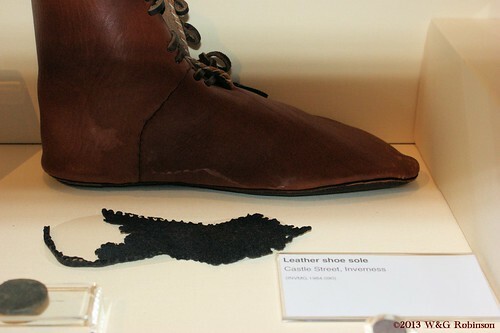 Leather shoe soles. The one on the right is a child’s size. 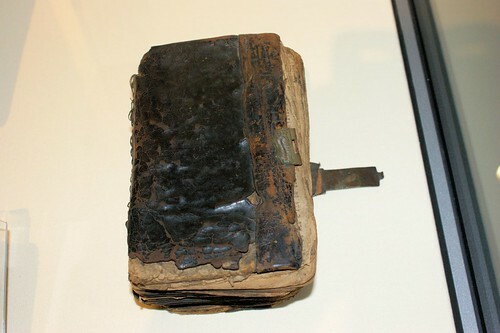 15-16th century. 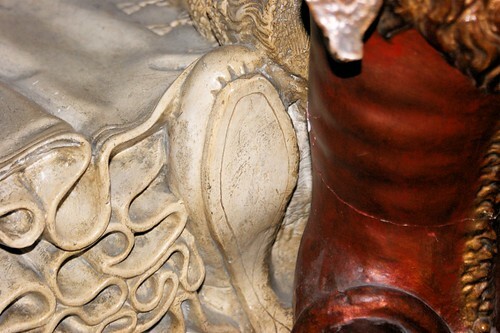 Shoe sole detail, Tomb of Mary Queen of Scots. 1606-12. The cut in the sole for hiding the welting [see comment below] sole stitches can be clearly seen. 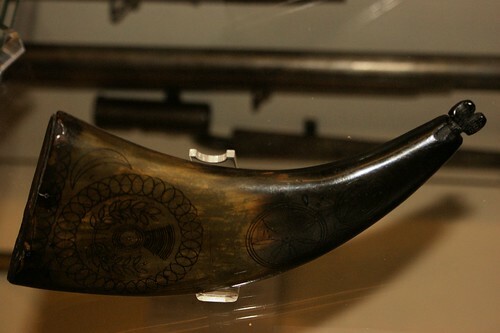 Large bombard from the 17th century, four layers of leather in the handle, possible traces of red paint on the back edge. H.JS32. I have some detail photos here. 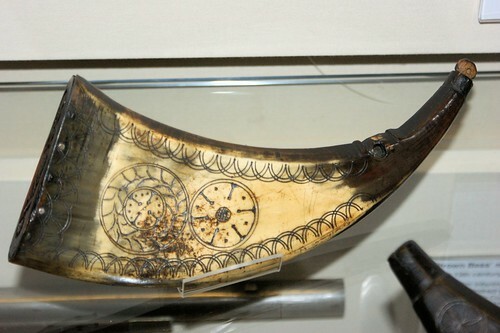 R: with scabbard and gilt and decoration on the blade, dated 1617. Scottish, probably Edinburgh. H.LC. 111a and b. Note the diamond cross-section. 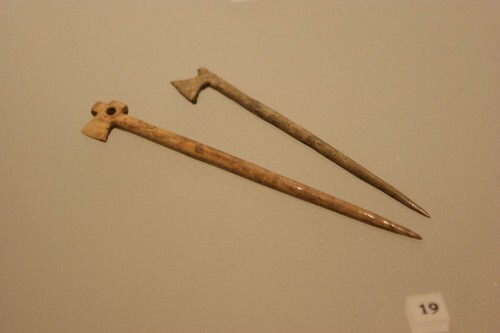 Most earlier daggers of this type have triangular cross-section blades. It’s probably time I wrote about something other than leather. We had a huge bag of bones in the freezer and some spare time over the weekend, so I’ll talk about preparing bone. There are as many different opinions on the best way to prepare bone as there are bone workers. A couple whose opinion I value strongly state that it is simply impossible to use bone from roasted meat because the resulting bone is too brittle. Others equally emphatically insist that raw bone is the only way to go. I beg to differ. 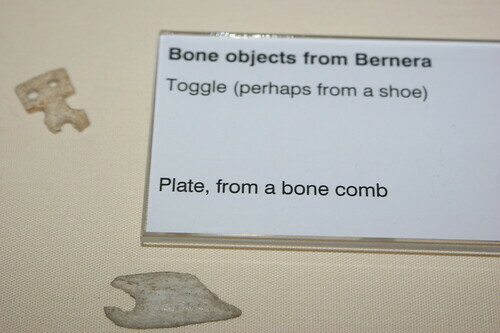 I find that as long as you don’t use the exposed ends, bones from your Sunday roast work fine. There’s lots of ways of cleaning bone. Medical specimens can be cleaned using beetles, or if you have lots of space and a strong stomach, using anaerobic bacteria in a sealed water bath. I’m not going to make any claims to accuracy in this technique. 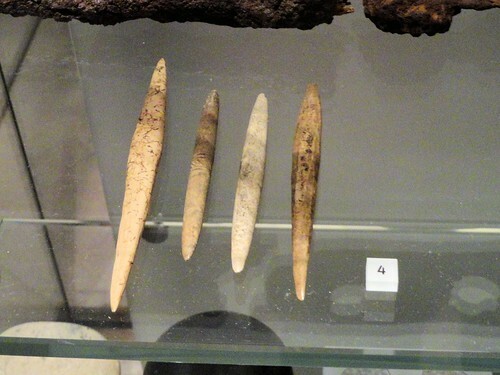 I haven’t done enough research to know exactly what was done, I’m drawing this from what I was taught years ago by a metalworker who prepared bones for knife handles, and my experience since. I’ll make the big assumption that historically, meat wasn’t filleted before use and the bones were cooked. 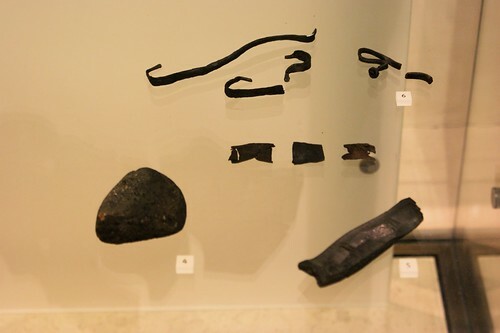 A quick look at the cooking techniques of your chosen period would indicate whether boiling, roasting or other methods were more common. Try to stick to this method of cooking for bonus authenticity points. If you are using whole bones, cut one end off to expose the marrow before boiling, otherwise it will go off during the subsequent steps and when you get around to cutting the bone to work on, the ensuing explosion isn’t very pleasant. Collect a sufficient quantity of bones, throw them in a pot with copious quantities of water and boil until all the scraps of meat, fat, cartilage and tendon can easily be scraped away. A metal skewer can help loosen the marrow so all that you are left with is a pile of cleanish bones and a damn fine broth. Once clean, I let sunlight, rain and ants do the final clean. If there’s a problem with dogs or native animals running off with your freshly cleaned bones, make a wire cage to hold them together. Exposure for 2-3 months seems to work for me. 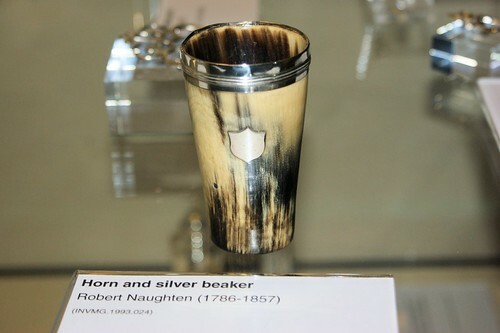 I’m about half way through the photos from the National Museum of Scotland, it takes a while to sort 800-odd pictures. I couldn’t resist the temptation to share this one. 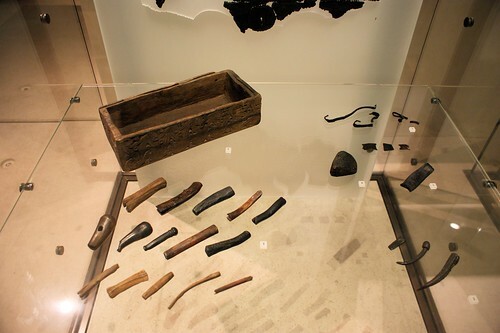 It’s a leather worker’s toolkit, dated from between AD650 and 950 * from Evie, Orkney. 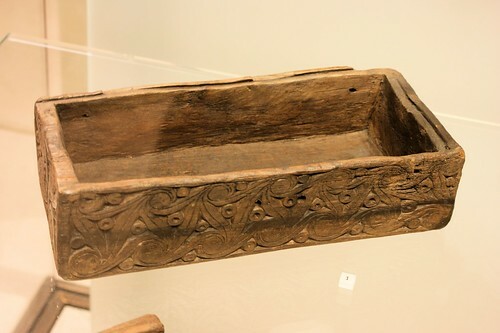 The box is made from a single piece of timber, hollowed out so there’s no joint in the base for the heavy tools to push out. 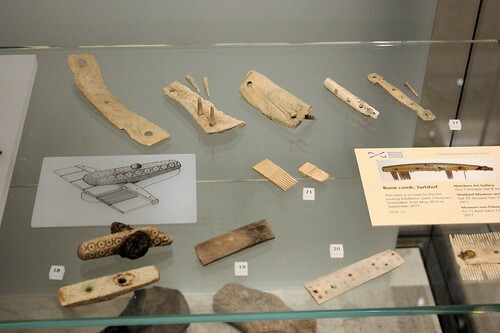 Some of the tinder boxes from the Mary Rose (82A0070, 81A1718, 81A3874 and 81A 5922) are done the same way, although in the latter case to keep moisture out of the tinder. Carving on the back of the tool box. 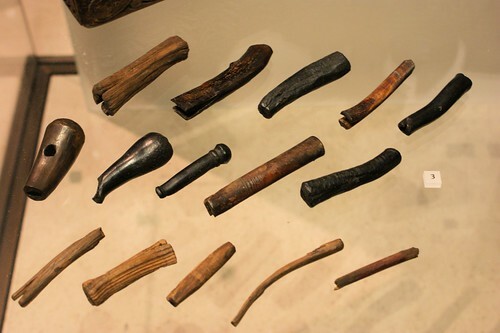 Tool handles. 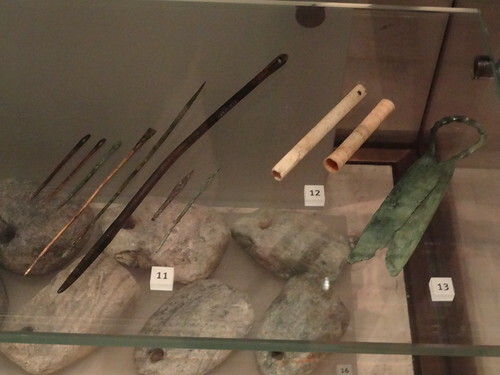 The metal blades have obviously corroded, but many can be inferred from the handle shapes. 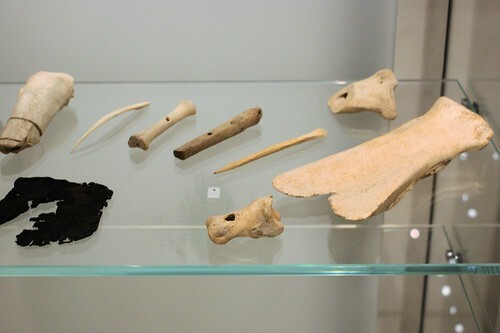 Pumice, antler and leather thong. I wonder if the antler is an edge slicker? 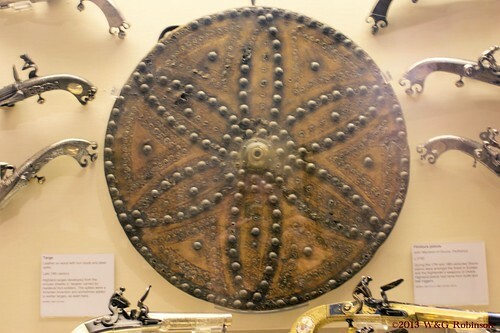 The original can be seen in the National Museum of Scotland in Edinburgh. 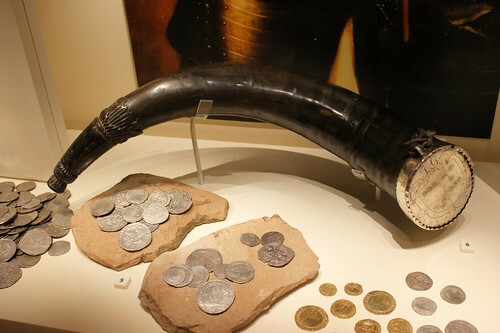 * An earlier version of this post had incorrect dates of 550-850 for the finds.